Snowmelt has caused all this wild flooding in the Midwest. The flooding to hit the Midwest as a result of last week’s wild bomb cyclone is no joke. It’s already killed at least four people, according to the Washington Post, and Vice President Mike Pence was in Nebraska Tuesday to survey the damage. Satellite images tell a tale of swollen rivers and dramatic flooding in Nebraska, Iowa, South Dakota, Kansas, and Missouri, which is creating major problems for local farmers. There’s another often-overlooked sector of our society that’s dealing with severe impacts, too: tribal communities. Four tribal nations in Nebraska—including the Ponca Tribe, the Omaha Tribe of Nebraska, and Winnebago Tribe of Nebraska—have declared states of emergency, as well as a couple other tribes in South Dakota, according to national and local news reports. Tribes are especially vulnerable to extreme weather because their culture and economies are often linked to their water, land, and natural resources, as the Fourth National Climate Assessment points out. Inadequate or out-of-date infrastructure can further exacerbate their vulnerability. Remote dirt roads, in particular, are non-navigable when this level of rain hits, and such unpaved roads are all too common on tribal lands. The Santee Sioux Nation in Nebraska, for instance, has been dealing with severe flooding impacts in wake of last week’s bomb cyclone-induced blizzard. The tribe, whose roughly 1,000 members are located in the state’s northeastern corner near the Missouri River, issued an emergency declaration March 12 because officials anticipated flooding as a result of ice whose accumulation would block the flow of water in nearby lakes, rivers, and tributaries, said Jon Sahagun, the nation’s director of emergency services. That expected flooding came, “and then some,” Sahagun told Earther. Floodwaters in Niobrara, Nebraska, where many Santee Sioux people live, literally tore through the reservation, dividing it in half. The tribal nation has temporarily evacuated some 375 people, and it estimates that at least 10 are permanently displaced from the damage to their homes. Five homes were completely destroyed, but there are “many more with minor and major damage,” Sahagun told Earther. The flooding has compromised the tribe’s water supply and damaged the water system, so they’ve been relying on federal aid to supply them with bottled water. Power outages and inaccessible roads have only compounded the problems. So far, though, the tribal government hasn’t received any state or federal dollars to aid in their recovery, but it’s in close contact with county officials who are helping coordinate aid. The Santee Sioux Nation is requesting a preliminary amount of $30 million for recovery, said Sahagun. 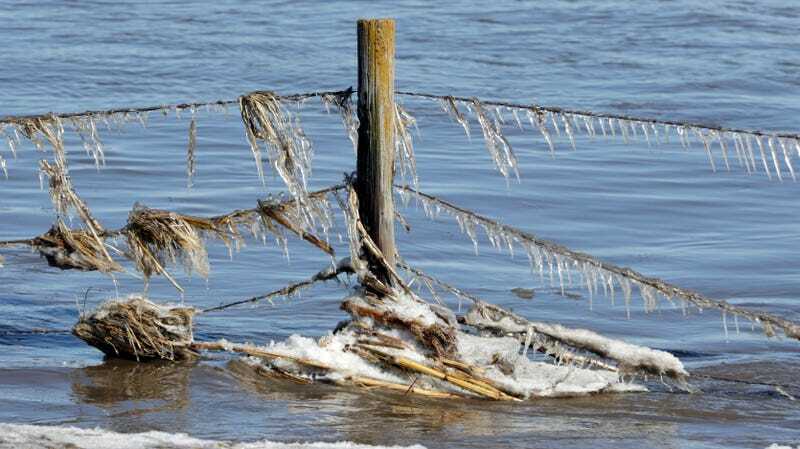 The Federal Emergency Management Agency confirmed it’s received requests for public and individual assistance for the Santee Sioux, as well as the Ponca, Winnebago, and Ohama tribes in Nebraska, in an email to Earther. Laura Hintz, emergency manager for Knox County where Niobrara is located, said that if the county receives any financial aid, it will allocate some for the Santee. While the Santee await aid allocations, tribal communities in the region are coming together to do what they can for each other. Tribal Treasurer Derek LaPointe’s name is linked to a GoFundMe for the Santee Sioux March 16. So far, the campaign has raised more than $9,000 of its $40,000 goal. This money is supposed to go toward repairing the damaged water system. The Nebraska Commission on Indian Affairs donated $1,000. Floodwaters are finally starting to recede in the Midwest, but they’re rising downstream as the water begins to move south into Kansas, Missouri, and Mississippi, according to Reuters. As the waters dissolve up north, the true extent of the damage will reveal itself. For some, like Tribal Chairman Roger Trudell, the disaster is a harbinger of a future scientists have been predicting for years, one in which floods like this become more common in the Midwest, threatening tribal communities’ access to fish, game, and crops.